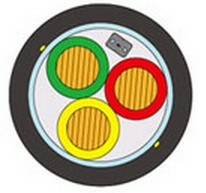 General Description: OPLC is a new type of photoelectric composite cable for low voltage power line,which has the functions of the common low voltage cable and communication optical cable.In structure,OPLC integrates optical fiber and copper transmission and distribution lines,and by using optical fiber composite low voltage with passive optical network (PON) technology,realizes fiber to the home residential users’ electricity information collection business carrying information intranet,and information outer network “ Network convergance” businessmeets the demands of smart grid informatization,automation and interaction. Product Advantages: 1. It integrates optical fiber and power distribution cables and can avoid secondary wiring,so it can effectively reduce the cost of construction,network construction,etc. 2. It’s applicable to a variety of business types with strong adaptability and strong expansibility and wider adaptation range. 3. It’s with strong mechanical properties,such as shock resistance,good resistance to lateral pressure and strong environment adaptability. 4. It’s green and the safety performance is superior. 5. The optical unit is compatible with power cable working temperature for a long time. 6. The cost of OPLC is less than 10% higher than that of the traditional low voltage cable.The comprehensive cost of PFTTH scheme using OPLC is about 40 percent less than that of the traditional cable + optical cable route plan. Application Places: Transformer room tolow pressure coupling box; low pressure coupling box to user’s electric supply meter; electric supply meter to user’s indoor.